The classical haplotype phasing problem. Over the past few years, our group has written several papers on inferring haplotypes from sequence data. The problem of Haplotype Inference referred to as Haplotype Phasing has had a long history in computational genetics and the problem itself has had several incarnations. Genotyping technologies obtain “genotype” information on SNPs which mixes the genetic information from both chromosomes. However, many genetic analyses require “haplotype” information which is the genetic information on each chromosome (see Figure). In the early days before reference datasets were available, methods would be applied to large numbers of genotyped individuals which would attempt to identify a small number of haplotypes which explained the majority of the individual genotypes. Methods from this period include PHASE (11254454) and HAP (14988101) (from our group with Eran Halperin). The figure is actually one of Eran’s slides from around 2002. Once reference datasets such as the HapMap became available, imputation based methods such as IMPUTE(10.1038/ng2088) and BEAGLE(10.1016/j.ajhg.2009.01.005) dominated previous phasing approaches because they leveraged information from the carefully curated reference datasets. 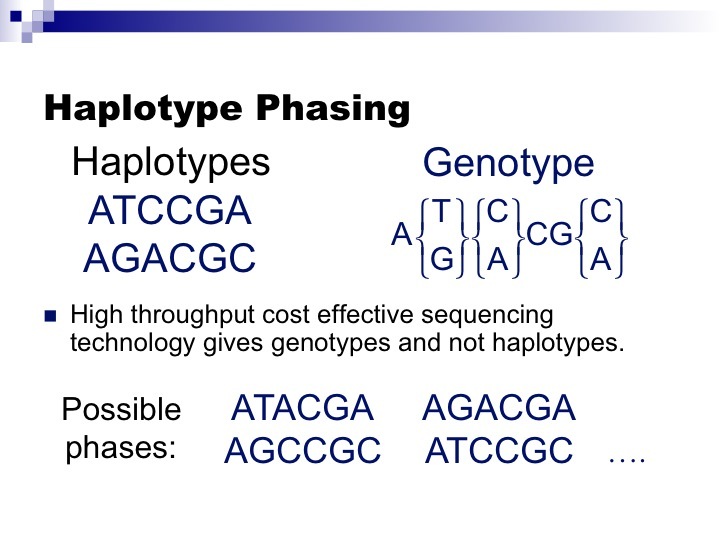 In principal, haplotype phasing or imputation methods can be applied directly to sequencing data by first calling genotypes in the sequencing data and then applying a phasing or imputation approach. However, since each read originates from only one chromosome, if a read spans two genotypes it provides some information on haplotype phase. Combining these reads to construct haplotypes is referred to as the “haplotypes assembly” problem which was pioneered by Vikas Bansal and Vineet Bafna(10.1093/bioinformatics/btn298),(10.1101/gr.077065.108). Dan He in our group developed an optimal method for haplotype assembly which guarantees finding the optimal solution for short reads and reduces the problem of haplotype assembly for longer reads to MaxSAT which finds the optimal solution for the vast majority of problem instances(10.1093/bioinformatics/btq215). More recently, others have developed methods that can discover optimal solutions for all problem instances(10.1093/bioinformatics/btt349). In his paper, Dan also showed that haplotype assembly will always underperform traditional phasing methods for short read sequencing data because too few of the reads span multiple genotypes. To overcome this issue, Dan extended his methods to jointly perform imputation and haplotype assembly(10.1089/cmb.2012.0091),(10.1016/j.gene.2012.11.093). These methods outperformed both imputation methods and haplotype assembly methods but unfortunately are too slow and memory intensive to apply in practice. More recently, in our group, Wen-Yun Yang, Zhanyong Wang, Farhad Hormozdiari with Bogdan Pasaniuc developed a sampling method which is both fast and accurate for combining haplotype assembly and imputation(10.1093/bioinformatics/btt386). In: J Comput Biol, 20 (2), pp. 80-92, 2013, ISSN: 1557-8666. In: Bioinformatics, 2013, ISSN: 1367-4811. In: Gene, 2012, ISSN: 1879-0038. In: Bioinformatics, 26 (12), pp. i183-90, 2010, ISSN: 1367-4811. MOTIVATION: Haplotype inference is an important step for many types of analyses of genetic variation in the human genome. Traditional approaches for obtaining haplotypes involve collecting genotype information from a population of individuals and then applying a haplotype inference algorithm. The development of high-throughput sequencing technologies allows for an alternative strategy to obtain haplotypes by combining sequence fragments. The problem of 'haplotype assembly' is the problem of assembling the two haplotypes for a chromosome given the collection of such fragments, or reads, and their locations in the haplotypes, which are pre-determined by mapping the reads to a reference genome. Errors in reads significantly increase the difficulty of the problem and it has been shown that the problem is NP-hard even for reads of length 2. Existing greedy and stochastic algorithms are not guaranteed to find the optimal solutions for the haplotype assembly problem. RESULTS: In this article, we proposed a dynamic programming algorithm that is able to assemble the haplotypes optimally with time complexity O(m x 2(k) x n), where m is the number of reads, k is the length of the longest read and n is the total number of SNPs in the haplotypes. We also reduce the haplotype assembly problem into the maximum satisfiability problem that can often be solved optimally even when k is large. Taking advantage of the efficiency of our algorithm, we perform simulation experiments demonstrating that the assembly of haplotypes using reads of length typical of the current sequencing technologies is not practical. However, we demonstrate that the combination of this approach and the traditional haplotype phasing approaches allow us to practically construct haplotypes containing both common and rare variants.